The charming and talented Donna (of North Van Urban Yarns fame) has come up with a great little summery tank that is sure to get you in the mood for some hotter weather. She knit this beauty up in the Great Adirondack 1/2-inch ribbon, a unique yarn in its ribbon-y texture. Great Adirondack comes in some fantastic hand dyed colours, perfect for the bright season ahead. 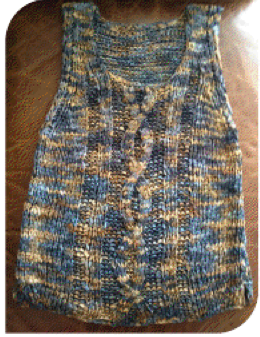 The tank knits up quick on 8mm (US 11) needles with a cable detail in the middle to keep things interesting. The yarn has a lot of drape (it’s made of rayon) so it works well for a swingy tank! The pattern is available for free in the shop with yarn purchase. This entry was posted on Monday, March 26th, 2012 at 10:19 pm	and is filed under Uncategorized. You can follow any responses to this entry through the RSS 2.0 feed. Both comments and pings are currently closed.